Colour Haze is a German psychedelic/stoner rock group who have been quietly but noisily carving out their own territory since 1995 when they released their debut album “Chopping Machine”. The band features founding member Stefan Koglek on guitar and vocals, plus bassist Philipp Rasthofer and drummer Manfred Merwald, both of whom joined the fold in 1998. 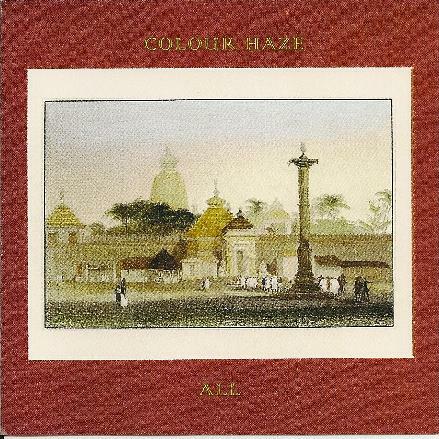 All told, Colour Haze have released seven albums (plus a live video), appeared on several compilations and toured across Europe several times. Taking their instrumental cue from the sounds of Black Sabbath and Iron Butterfly, Colour Haze serve up densely textured slices of heavy rock. This is most obviously seem on the epic title track, where what begins with a slow-burning guitar intro, eventually builds into an explosion of growling bass, drums and thickly distorted guitars. This is followed by the equally powerful “Fall”, which almost feels like part two of the same track. Most tracks on the disc are group compositions, and the emphasis is less on flashy guitar solos than on thundering power trio style jams. Things take on an experimental edge on “Turns” (one of only two tracks where Koglek gets a solo compositional credit), which features reversed tapes, giving it an eastern vibe. This is continued on the sitar-flavoured “Stars”, and even the Hindu temple album cover. While not being a spacerock album as such, the head-down full-on psychedelic jamming on tunes such as the instrumental “Lights” brings to mind the sounds of Sweden’s First band From Outer Space. If there is any weak point to this album, it would have to be the vocals. There is nothing particularly bad about Stefan Koglek’s set of pipes, but his voice isn’t strong or distinctive enough to raise him up to the level of a Josh Homme or Ozzy Osbourne, and the lyrics seem less concerned with connecting with listeners than with providing another set of sounds in the instrumental mix. That aside, Colour Haze have plenty to offer fans of hard and heavy rock music, and “All” is a fine introduction to their melodic yet aggressive sound. Stefan and the band are back with another studio album, produced at the same studio as the last several and with that excellent true analog sound (I have not heard the vinyl yet). This is the bands least heavy and most melodic record they have ever made and for sure their most diverse. It is interesting to see them moving in a different direction. The bass, drums and guitar have that distinct Colour Haze sound (some think at least the guitar sound should change as it makes too many of their songs sound alike). I guess it is their signature. The opening track, Silent, is classic Colour Haze, and this one you might have heard at one of their concerts. Moon, a track they played on the Rockpalast TV program, is next and sees Stefan singing at the very limits of his range. Both riff rock tracks with few solos. Next up is a beautiful acoustic guitar piece called Turns. Cool backwards effects and nice overdubs.. A new experiment for Colour Haze, with some Hendrix inspiration. Lights is a great instrumental track with amazing playing by the whole band. Stefan really plays some amazing guitar and you can hear some organ as well on this track. IF speeds things up a bit and is a distinctive Colour Haze rock song with Philips bass and Mani's driving drums and Stefan's signature riff. The mid section gets quite psychedelic and features some piano buried in the mix as well. Stars begins with a sitar and Philip on acoustic guitar! Stefan is joined by Daniela on vocals. ALL, the 15 min title track, is next and it has a bit of everything and is an epic that starts off slowly like many of their long songs from the past. It is 4 mins before the drums come in. Before that it is Stefan and Philip weaving their path. At 9 1/2 minutes Stefan takes off and does a great 3 minute guitar solo before we return to the main riff of the song as the track builds up to its ending with the organ blending in masterfully. Fall is nearly 10 minutes and not one of the more groundbreaking tracks on the album. One has a very slow pace or groove and is quite melodic and a bit bluesy and features very repetitive lyrics and some nice sitar bubbles up and dominates the sound at the end. Strange ending that almost sounds like a mistake when the song ends completely and then starts fading back in after a few seconds? The CD ends with Remains, a slow track with just Philip on bass and Stefan playing very deep bass sounding guitar. Another masterpiece.